Hemineglect - where is the lesion ? Which side is neglected? Mnemonic: Hemineg-left. Left side is neglected. Lesion located in the right parietal lobe (non dominant lobe). Interesting fact: Right-brain-damaged (RBD) individuals with spatial neglect often depict an object with left-sided features absent on drawing. 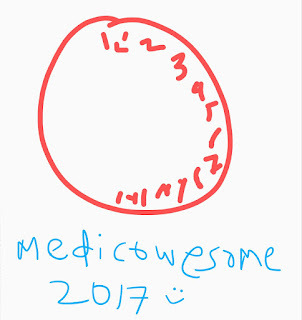 Usually, the patient is asked to draw a clock. The drawing of patients with hemineglect contain empty space on the left, as if the clock were covered by an opaque semicircle. However, this metaphoric occlusion frequently leaves the rim of the clock unaffected. 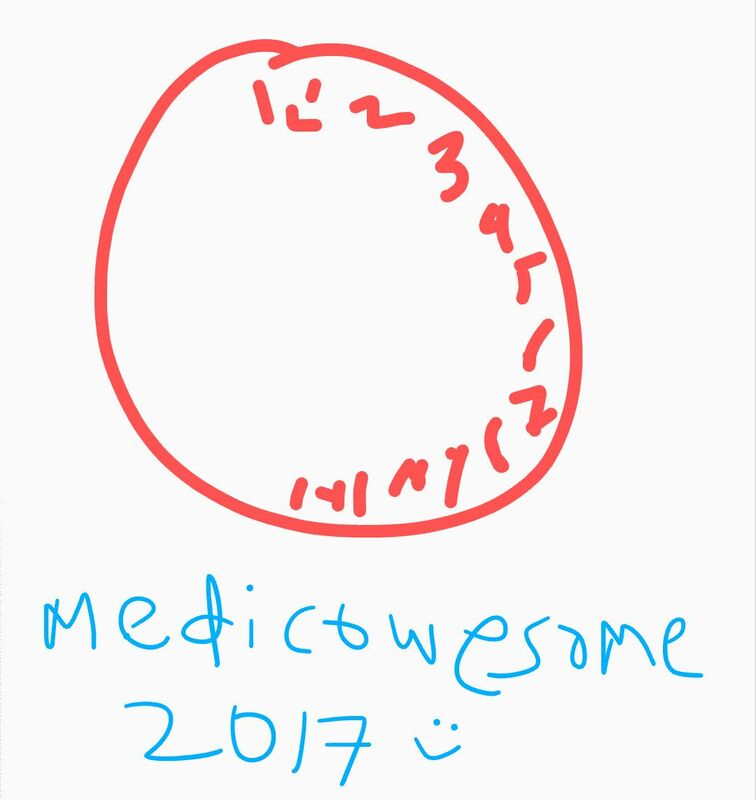 The circular outline is rarely compromised in neglect patients’ clock drawings and is almost always the first feature produced in the task. Doubt: Why does torn meniscus present with inability to extend the knee? I don't understand the anatomy correlation. If there is complete tear, the meniscus (a piece of it) gets dislodged. It gets stuck in the knee joint. Inability to extend the knee. Pain on extension of the knee. Why is it called "bucket handle"? A bucket handle meniscus tear represents a complete tear of the mensicus support or the ligament that holds the meniscus in place. This allows the meniscus to flop over like the handle on a bucket. When the meniscus flips over it becomes stuck in the middle of the knee joint, you lose the ability to fully straighten the knee then you have a “locked knee”. Meaning of valgus: A deformity involving oblique displacement of part of a limb away from the midline. Doubt: Why is genu valgum knock knees? The knees (genu) are displaced towards the midline! Answer: It's not the knees we consider during the deformity... It's the relationship of distal part with the proximal part at a joint. Mnemonic: L in vaLgum is for Lateral displacement. Suppose there is an obstruction to cerebral venous drainage in the left side, and u r doing an LP with manometry. If u occlude the left internal jugular vein, there will be no change in pressure but if u do it on the right side, there will be increase in csf pressure. The vagus nerve exerts several homeostatic influences, including enhancing gut motility, reducing heart rate, and regulating inflammation. Central to this pathway is the understanding of neurally controlled anti-inflammatory pathways of the vagus nerve. This neurally mediated anti-inflammatory pathway allows for a rapid response to inflammatory stimuli and also for the potential regulation of early proinflammatory mediator release, specifically tumor necrosis factor (TNF). Vagus nerve activity in the presence of systemic inflammation may inhibit cytokine activity and reduce injury from disease processes such as pancreatitis, ischemia and reperfusion, and hemorrhagic shock. This activity is primarily mediated through nicotinic acetylcholine receptors on immune mediator cells such as tissue macrophages. Furthermore, enhanced inflammatory profiles are observed after vagotomy, during stress conditions. The nerve which supplies a muscle of a joint, will also supply the joint and the overlying skin. Conversely, any nerve that is innervating a joint will also supply the muscles of the joint and the overlying skin. 1) Buccal branch of Mandibular nerve as we all know, pierces the Buccinator muscle. But it doesn't supply the muscle. The innervation of Buccinator is by the Buccal branch of Facial nerve. 2) Sciatic nerve in the Gluteal region....is very closely related to the Pyriformis muscle.... And may occasionally send a fibre that pierces the muscle. But it doesn't supply it. Pyriformis is supplied directly by the sacral plexus(the nerve to pyriformis). Here's my way out of the necrotising vasculitis. Pan intended ;;). Now Small Vessel Vasculitis can be classified further. It can be positive for a particular antibody called ANCA or it can be negative. This antibody is purely an association and not a causative one. And another baby related Vasculitis​ is HSP). Now ANCA positive Vasculitis can be either c-ANCA or p-ANCA depending on what part it stains. p-ANCA in Churg Strauss and Microscopic Poly-angiitis. Please note - The names of Wegner's and Churg Strauss have been changed to Granulomatosis with Polyangiitis , and Eosniophilic GPA respectively. This is said to be because the scientist Wegener had been discovered to be possibly related to some Nazi war time activities and this opportunity was made the most of to also take a step towards a more pathology-specific name-calling by altering the honorific name given to the disease. 1. Flame shaped haemorrhages are seen when they occur in the superficial layers of the retina because the blood can spread as tight junctions are not present there. 2.Dots and blots show up into the deeper layers because the space to spread for the blood is relatively lesser. 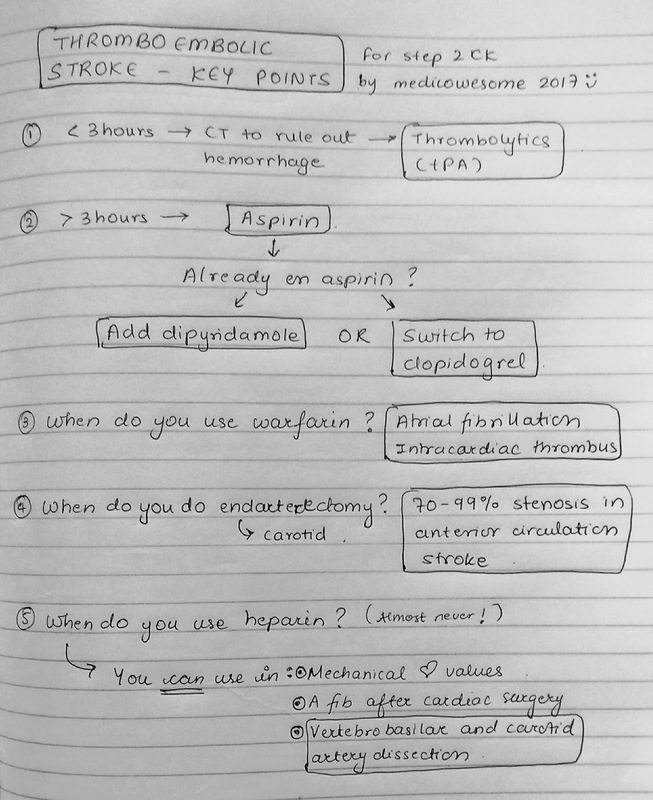 Did you ever find it time consuming and confusing to answer the multiple choice questions about the "what will you do next" questions for different heart rhythm disorders? Well, we did too. So, we are going to post some algorithms in subsequent posts, which will make it easier and save you some time in the preparation. They will guide your thoughts during those timed multiple choice questions. 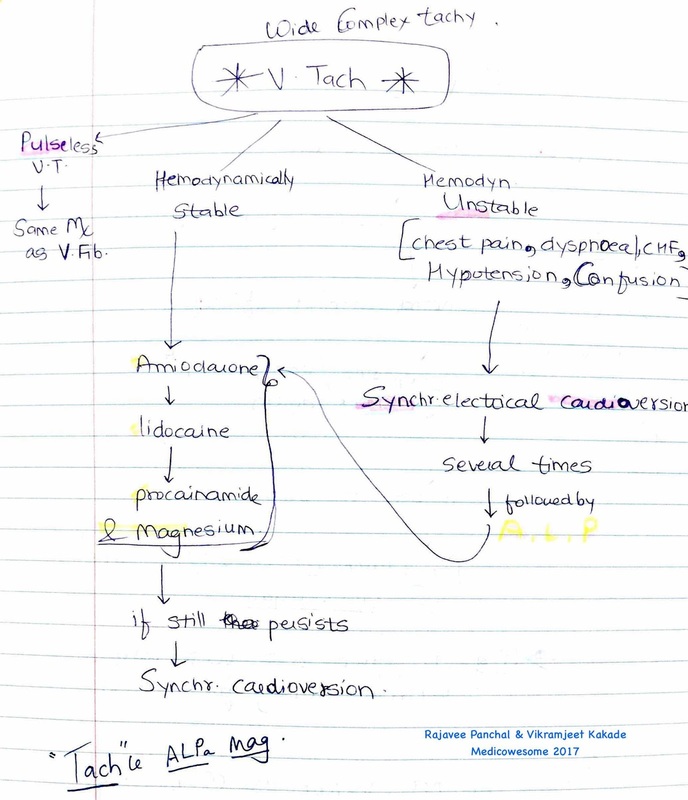 Ventricular Tachycardia: It's a type of ventricular arrhythmia. The EKG is a must have diagnostic test. Look for wide-QRS-complexes. If the EKG is inconclusive--> telemetry monitoring should be done. 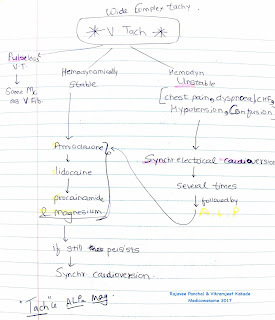 If the questions asks, what is the most accurate test to diagnose this patient with V.Tach--> its Electrophysiologic studies. Now, read very carefully the last line of the question as to what the question is demanding; it could be the next step in management or the test for a definite diagnosis. *LOOK FOR HIS MENTAL STATUS- is the patient confused/has altered mental status? *LOOK FOR SIGNS/SYMPTOMS OF CHF. If any of these are present--categorize the patient as Hemodynamically Unstable. And then, follow the chart below for management questions. We all wanna help others; but do we help ourselves? As a Medical student, or a doctor we all are opting for a profession of care for people. But often we forget that the people who need care includes ourselves too. How should we take care of ourselves. 1. One should take care of one's self. 2. One should take care of one's colleagues. Do you eat well? Do you sleep enough? Are you spending time with your family? All these fall into such a level about taking care of your ownself. As medical students we have long weeks and short sleeps. Let's admit, still we don't have enough time. EAT WELL. Food is essential for your sustenance. Eat nutritious food. Not just starch and sugary food. Opt for some fruits, yoghurt and more veges. Our professor said it is better to get yourself a multivitamin complex if you feel like you are running out of enough nutritious food. SLEEP WELL. Sleep is one of the most important aspects of your daily life. You probably cant sleep 6hrs straight. But get some decent sleep at least for 4hrs. And if you are taking a powernap, try taking it in multiplies of 90mins. I saw it recently in an article 90mins(180/270 etc) of nap improves your ability to wake up fresh as it is appox 1 sleep cycle. EXERCISE WELL. You dont have hop into University gym and run on those treadmills for your dear life, but obvio try taking a stroll with your friends in the ground, or get a brisk walk to market instead of getting a taxi or riding there. RELAX WELL. We surely don't have time to sit on a sedan chair and reflect on life or get a bikini/short picnic to the nearest beach when we have an Internal Medicine exam 3 days away. But surely you have time to go grab a coffee and enjoy it without looking at your jumbled up notes. (They aren't much readable anyways jk...), Sit on a short wall and swing your legs like you remember all the drug regimes of the world. Look at the sky from the terrace and try to find a constellation or two that you learned in Grade school. Listen to a song that uplifts you or soothe you depending on your mood. Sketch something (personal secret : I sketch my crushes when I'm stressed ). Do something that makes you feel good. Meditation or yoga or something are good too. If spa, manicure pedicure, massage works for you, by all means go for it too. CHECK-UPS. What is the last time you checked if you have enough Hgb count? Get your personal body checkups. You are only riding that Car, don't forget to check the oil and water levels too. Even a Benz or a BMW can wreck havoc if they don't have enough care. Get yourself done a teethscaling. ENVIRONMENT. Look at your desk. Does it look like that you just performed an exocism there?  Clean it up yo! Clean your desk. Your room. Keep some airfreshners, keep stuff that motivate you surrounding you. Not things that make you feel like "I'll rather live in the library!".  Get enough Oxygen into your place and for all the love for Zeus, don't get into a room without enough ventilation. MENTAL HEALTH. Almost every university provides free mental health counselling to its students. What was the last time you used it? Last time I had stress issues with my Neurology final exams, I went to meet a guidance counsellor. She totally listened to me and made me feel good. And another time when I felt like I'm losing my interest and the passion, I talked to my psychiatry professor.I think you should talk to someone qualified about it. And never think talking to a psychiatrist or a counsellor is a bad thing. In the long run it will help you heaps. 2. How to take care of your colleagues. Ok we don't even have time for ourselves. I agree. But please don't leave those who are around you. We all are in the same journey. Look out for them. Check if they ate their meals. If they forgot their attendance. Check if they are okay. If their relationships are going well. If they are performing fine in exam. Look out for people around you. Close friends are the first people are recognize depression and anxiety in a person before it attains to clinical levels. If you notice a difference talk to them. Or lead them to talk to someone qualified about it. If someone is losing marks and failing exams offer to help them. If they ask for support never refuse. Be a good person to others, this way you will be a good doctor too. That's it for now folks. Enjoy and always take care of yourselves and others around you. Young, non smoker, female comes with complaints of sore throath, dry cough, nasal congestion for 10 days. Now, she feels better however she coughs out yellowish expectoration. There are scattered wheezes and crackles that clear with coughing. You've ordered relevant labs and meanwhile the patient asks you if she would need antibiotics. What would your next step be? Reason: Since there is a history of preceding viral infection and her current situation indicated Acute Bronchitis, the expectant management would be fairly Symptomatic! Infact, there are articles that state that giving antibiotics could worsen the patient condition! Also, judicious use of antibiotics can help prevent antibiotic resistance. I was off to the States for my Clinical Electives at Mayo Clinic and Cleveland Clinic, so I'm going to briefly write about Electives in this post. - Considered better as what can be better than hands-on! - Controversial if it can be considered as USCE? - Usually, longer the elective, the better it is! (Increases yield of getting a fruitful publication out of it. - No outlined criteria, eligibility varies from place to place. I had given my USMLE Step 1 while I was in Third year. So, when I got into Fourth year I applied to Universities that had USMLE Step 1 criteria. As now a days, getting electives is becoming more and more competitive, along with my friends, I applied to IMG friendly elective places well in advance (about 10 months prior for a few places). This also meant that we had to wait for a long time to get our acceptances as they don't send out acceptances until 3-1 month prior to your elective start date. What to do while you're there? - Be professional, dress professionally, follow code and conduct of your Hospital or Clinic. - If you find an interesting case while you're rotating there, discuss with your residents/ fellows/ attendings if you can submit it to a journal or present it at any conference. - If you're interested in research, talk to your attending and try to get involved in one. - Most importantly, As an IMG, it is crucial for us to get A Strong Letter of Recommendation. If you've been working hard, I am sure, most attendings would agree to write you a Strong LoR! Hurray! Also, once you are done with your elective, in the following week or so, it is good to write your attendings a courtesy/ Thank you email, so that they know you really learnt during your elective! So today in the surgery OPD I happened to see a case of Lymphedema feet ,and hence thought of reviewing some important points on same. So, Congenital lymphedema may involve a single lower extremity, multiple limbs, the genitalia, or the face. The edema typically develops before 2 years of age and may be associated with specific hereditary syndromes -Turner syndrome,Milroy syndrome, Klippel-Trenaunay-Weber syndrome. Lymphedema praecox is the most common form of primary lymphedema, accounting for 94% of cases. Lymphedema praecox is far more common in women, with the gender ratio favoring women 10:1. The onset is during childhood or the teenage years, and the swelling involves the foot and calf. Lymphedema tarda is uncommon, accounting for <10% of cases of primary lymphedema. The onset of edema is after 35 years of age. Secondary lymphedema is far more common than primary lymphedema. Secondary lymphedema develops as a result of lymphatic obstruction or disruption. Other causes of secondary lymphedema include radiation therapy, trauma, infection, and malignancy. Globally, filariasis (caused by Wuchereria bancrofti, Brugia malayi, and Brugia timori) is the most common cause of secondary lymphedema. This post will be on the classification of Atelectasis based on its pathophysiology and a brief overview of its radiology patterns. 6. obscuration or desilhouetting of the structures adjacent to the collapsed lung (eg, diaphragm and heart borders). Google the Chest X ray scans for atelectasis to consolidate the above points. Now the lengthy part, The Pathophysiology. Let us start with active or obstructive atelectasis. Obstructive atelectasis is a consequence of blockage of an airway. Air retained in the alveoli distal to the occlusion is absorbed into the pulmonary capillary blood since the pressure of gases in the blood plasma (PvO2) is lower than that in the alveoli. For this reason, it is also called absorptive atelectasis. This causes the affected regions to become totally gasless and then collapse. Obstruction of a segmental bronchus is less likely to result in segmental atelectasis than obstruction of a lobar bronchus is to produce lobar atelectasis. This difference is because of collateral ventilation between bronchopulmonary segments within a lobe. Once there was a priest named Kohn who decided to help out a fellow bronchopulmonary segment in aeration. Brother Kohn being eldest and hence weak could only manage to dig a pore. His work was carried on by Brother Boren who bored (as his name suggests) and made this pore into a fenestration. There was still some work left. And for that Brother Boren asked the help of the engineer Brother Lambert. Brother Lambert, after much hard work was eventually able to dig up a canal all the way upto the neighbouring segment so that they can share the aeration bestowed upon them by Lord Almighty! So we have three distinct collateral connections: 1. Pores of Kohn, 2. Fenestrations of Boren and 3. Canals of Lambert. So you need to defeat these three if you want to cause obstructive atelectasis. Let's dig a bit deeper into Fenestrations of Boren. These collateral channels are extensively prominent in an emphysematous lung. Now take a case of a 60 year old male smoker with emphysema who has now developed small cell carcinoma. Suppose there is a tumor mass obstructing the right bronchus, this patient will take a lot of time to develop obstructive atelectasis in the right lung because of the presence of extensive network of fenestrations of Boren. Hence, this patient will become symptomatic late and thereby will be diagnosed late. Blessing or Curse! One more thing, it has been observed that atelectasis occurs more rapidly in patients on oxygen therapy. Why? There is a simple reason behind this. 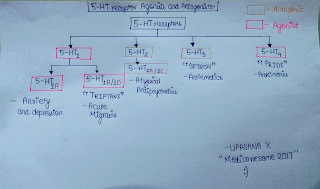 Oxygen is more soluble than nitrogen in water, when you give inhalational O2 with a FiO2 take 50%, you are altering the partial pressures of gases in the alveoli, Nitrogen which was 79% will fall down to below 50% and O2 which was 20% will rise upto 50%. Hence overall solubility rises, this elevates the tendency and spontaneity of gases diffusing into the blood plasma. Honestly speaking, rest of the causes are nowhere as important as the one mentioned above so let us try to ace them quickly. A. Relaxation (ie, passive) atelectasis ensues when contact between the parietal and visceral pleurae is eliminated. While this is usually due to a pleural effusion or pneumothorax, a large emphysematous bulla can have a similar effect. In this case, the residual physiologic elastic recoil of normal lung parenchyma allows the normal lung to collapse away from the chest wall with consequent loss of volume. The middle and lower lobes may shrink more than the upper lobe in the presence of a pleural effusion, while the upper lobe may be affected more by a pneumothorax. B. Adhesive atelectasis is a consequence of alveolar instability due, in part, to surfactant deficiency or dysfunction. As its name suggests, the alveoli walls will collapse into the alveolar space sticking with each other. In the normal lung, surfactant reduces the surface tension of alveoli and decreases the tendency of alveoli to collapse. Decreased production or inactivation of surfactant leads to alveolar instability and collapse. Adhesive atelectasis is a major problem in respiratory distress syndrome of premature infants(IRDS), acute respiratory distress syndrome (ARDS) in adults, acute radiation pneumonia, and posttraumatic lung contusion. C. Cicatrization (ie, cicatricial atelectasis) results from diminution of lung volume due to severe parenchymal scarring. Common underlying etiologies include granulomatous disease (eg, sarcoidosis), necrotizing pneumonia, and radiation pneumonia. D. Acceleration Atelectasis- This type of atelectasis has been described in pilots subjected to very high, vertical accelerative forces between 5G and 9G: at 5G, up to 50 percent of pulmonary airways are distorted and closed due to gravitational forces. The atelectasis is exacerbated by breathing a high fractional concentration of oxygen. Decreases in vital capacity are a reflection of this type of atelectasis in pilots. Acceleration atelectasis can cause symptoms like chest pain, coughing, and dyspnea. E. Rounded atelectasis (also called folded lung, Blesovsky’s syndrome, or atelectatic pseudotumor) is a distinct form of atelectasis associated with pleural disease, particularly following asbestos exposure and in India following pleural tuberculosis. Asbestosis is associated with pleural plaques and diffuse pleural thickening while pleural TB will have pleural thickening alongwith pleural effusion which eventually resolves with or without organization and pleural septations(Harbingers of Fibrothorax). In this condition, there is a subpleural mass mainly in the middle or lower lobes from which bronchi and blood vessels arise and they form a structure like a comet tail which traverses through the underlying atelectatic lung parenchyma to join at the hilum. Some un-astronomical sources compare this to a Vacuum Cleaner, with the dirt box as the subpleural mass and the hose as the comet tail. The condition where 'day blindness' is present is a cataract at the nodal point. Nodal point of the eye is where the rays of light pass through the lens without any refraction, usually at the centre of the lens. Thus, during the day, especially when out in the sun, the pupil contracts and the light has to pass through the cataractous area, causing diminution of vision. Immunotherapy is now an emerging and much promising intervention in the treatment of prostate cancer, apart from the traditional cancer treatments - chemotherapy, radiation and surgery. And you hear the Pinggg!!! Aha.. GOTHAM needs you!! You shift your focus from the task of studying to the task of on your cellphone,and simultaneously thinking about how good you are at multitasking! Well don't pat your Backs yettt. Although “multitasking” is a popular buzzword, research shows that only 2% of the population actually multitasks efficiently. Most of us just shift back and forth between different tasks, a process that requires our brains to refocus time and time again — and reduces overall productivity by a whopping 40%. Told ya! No need to pat your backs,for decreasing your efficiency. So the next time your Read ,you only Read. New Tel Aviv University research identifies a brain mechanism that enables more efficient multitasking. The key to this is “reactivating the learned memory,” a process that allows a person to more efficiently learn or engage in two tasks in close conjunction. Starts with - Training the brain. difficulty performing it and learning something else at the same time. This is due to interference between the two tasks, which compete for the same brain resources. The research demonstrates that - By pairing the brief reactivation of the original memory with the exposure to a new memory, long-term immunity to future interference was created. For example- researchers first taught student volunteers to perform a sequence of motor finger movements with Right hand. After acquiring this learned motor memory, the memory was reactivated on a different day, during which the participants were required to briefly do some task with their Left hand — with an addition of brief exposure to the same learned motor task being performed by the Right hand. By utilizing the memory reactivation paradigm, the subjects were able to perform the two tasks without interference. So well we now have an overview of how the brains circuits are intimately connected and how they can still constantly evolve. With this I finish the blog and my cup of tea!! Hematuria (blood in urine) may be microscopic or macroscopic/ gross. The American Urological Association (AUA) defines microscopic hematuria as 3 red blood cells/ high - power field on microscopic examination of the centrifuged urine specimen in two of the three freshly voided, clean- catch, midstream urine samples. Gross/ visible hematuria can result from as little as 1mL of blood in 1L of urine, and therefore, the color of urine does not necessarily reflect the degree of blood loss. - A glomerular source of bleeding (nephronal/ glomerular hematuria) usually results in persistent microscopic hematuria that may be with/ without intermittent periods of gross hematuria. - Total hematuria (present throughout the void) indicates bleeding of bladder/ upper tract origin. - If renal sources of hematuria are present, the blood is equally dispersed throughout the urine stream and does not clot. - Hematuria/ clots at the beginning of the urine stream ( initial hematuria ) is a symptom of a urethral cause. Terminal hematuria occurring at the end of stream may be caused due to either prostatic, bladder, or trigonal source of bleeding. 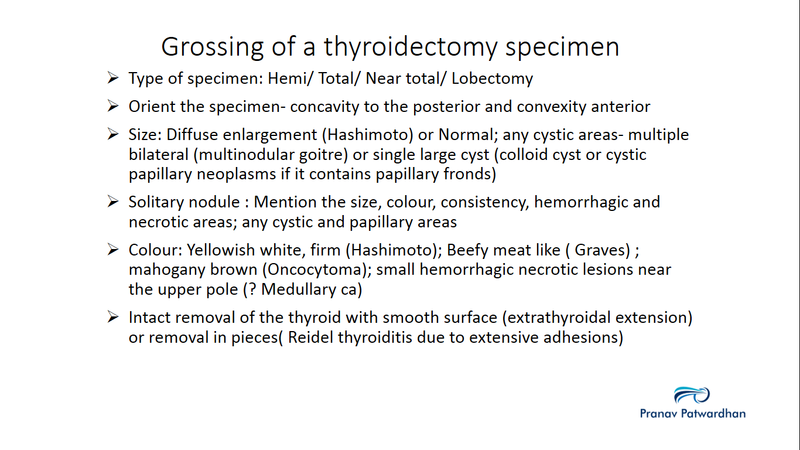 Thyroidectomy is often received for lesions found suspicious on FNA or in cases where goitrous enlargement causes clinical symptoms of obstruction. 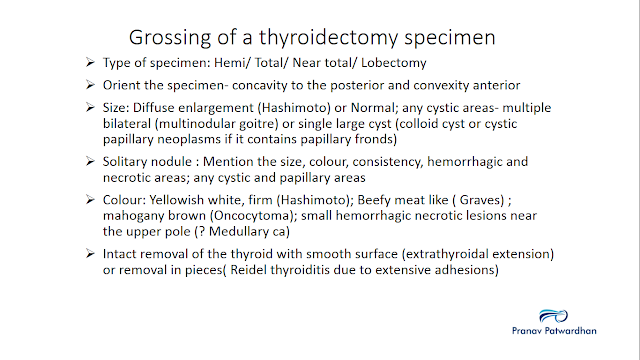 Hemi includes the lobe and the isthmus, lobectomy only the lobe, while near total includes almost the entire thyroid except a small part of the thyroid left behind. These are useful as anti-anxiety drugs. 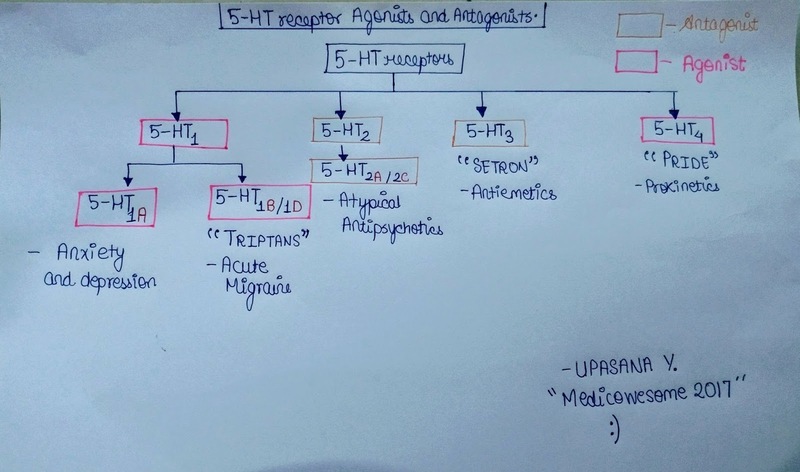 Agonists at this receptors are sumaTRIPTAN, NataTRIPTAN. These are useful for the treatment of acute migraine attacks. Antagonists are clozapine and risperidone. These are used as atypical antipsychotic agents. Antagonists are ondanSETRON, graniSETRON, tropiSETRON. These agents are used in chemotherapy induced vomiting. These are useful in the treatment of GERD. I had talked about how people with neuroticism also have an advantage of being creative in a previous post. There occurs a gap in the pharyngeal wall between the base of the skull and superior constrictor muscle called as Sinus of Morgagni. This space is closed by the pharyngeobasilar fascia. In nasopharyngeal carcinoma, the tumor may extend laterally and involve this sinus involving the mandibular nerve. This produces a triad of symptoms known as Trotter's Triad. Zenker's Diverticulum is a posterior pulsion diverticulum which occurs through the Killian's Dehiscence. Killian's Dehiscence is a potential gap between the oblique and transverse fibres of the inferior constrictor muscle. It is also known as the gateway of tears as it is a potential site of perforation during oesophagoscopy. Zenker's diverticulum occurs due to the outpouching of the pharyngeal mucosa at the site of Killian's dehiscence. There is incoordination between the descending peristaltic wave and the cricopharyngeus muscle at the upper oesophageal spincter which leades to high intra luminal pressure and the mucosal herniation through the weak area of Killian's Dehiscence. It is usually seen in elderly above the age of 60. 1. The most common symptom is Dysphagia, which is intermittent initially and later becomes progressive. 3. Regurgitation of food and cough. 4. There maybe regurgling sounds in the neck, gurgling sensation on palpation is known as Boyce sign. Malignancies may develop in 0.5-1% cases. 1. Endoscopic stapling of the diverticulo esophageal sphincter. 2. In patients not fit for major surgeries, Dohlman's surgery may be done. Waldeyer's Ring is an aggregation of lymphoid tissue seen in the subepithelial lining of pharynx guarding the nasopharynx and oropharynx in the form of a ring. Rhinolalia Aperta is a speech disorder which involves hypernasality in voice. The defect is seen in the failure of the nasopharynx to cut off from oropharynx. Some fibres of palatopharyngeus muscle make the posterior pillar, go posteriorly in the posterior wall of nasopharynx and along with the lower fibres of the superior constrictor muscle forms a ridge known as the Passavant's Ridge. During swallowing and speaking the passavant's ridge closes the nasopharyngeal isthmus. When this doesn't happen (eg- cleft lip, paralysis of palate) it leads to nasal regurgitation of food and nasal tone in speech known as Rhinolalia Aperta. 1. In children with cleft palate, special exercises can help in strengthening the muscles so as to reduce the nasality in voice. Differentials of lower limb ulceration: Venous, arterial or neuropathic? Q. Today, in our OPD, a 45 year old diabetic Male, farmer by profession presented with an ulcer on left lateral malleolus. He had a history of edema in lower limb associated with an itching 2 years ago. Since 6 months he got a non-healing ulcer on left lateral malleolus. Pigmentation of skin, eczema lipodermatosclerosis, atrophied Blanche are present and dilated veins on the medial aspect of left lower limb. My question is how to differentiate whether the ulcer is due to neuropathy, venous stasis or obliteration of artery. Why do the above doubt arise? Because venous ulcer are commonly found at the lower third of the leg usually on the medial side and even on the foot. 2. Test for the pain sensation, whether it is intact or not. (II) Venous ulcer have characteristic findings. History is utmost important. They are shallow and flat. The edge is sloping and purple blue color. The floor: - appears pink due to presence of granulation tissue. If it is a chronic ulcer there is more white fibrous tissue. Most important is A FAINT BLUE RIM of advancing epithelium may be seen at the margin. 1. Feel the dorsal pedis pulsation. 2. Ask for claudication also. Conclusion: - It was venous ulcer. Then why did it appear on the lateral side? Remember! On inspection dilated veins were found on the medial side. Before answering the above question. Let us ask why is it most common on medial side? There are more perforating veins on the medial side means more pressure in that area. But that doesn't mean lateral side is spared .There is some rise in pressure on lateral side also. The only thing that precipitated this was “Trauma”. Due to more itching on lateral side, he traumatised that area .It was initially small in size, non-healing ulcer which is gradually increasing in the size. Found this great article on the lower limb ulcers. So this random tip comes from a fun conversation that I was having with my study partner today. Recent evidence suggest that the gamma-aminobutyric acid-B receptor agonist baclofen is a promising agent for the treatment of alcoholism. Baclofen produces an effortless decrease or suppression of alcohol craving. It decreases alcohol consumption including in those with poor motivation. The drug causes few side effects and does not add to the intoxication effect of alcohol. Research has shown that baclofen reduces withdrawal symptoms of alcohol and is safe in those with liver impairment. Although further studies that compare long-term alcohol-related outcome of baclofen with established drugs such as naltrexone and disulfiram are needed. These were the questions asked during my pharmacology vivas. And I found it fascinating after studying. I have never studied these points about vitamins before! Q. Which vitamin deficiency is related with lowering of seizure threshold? Q. Why laropiprant (20mg) + Niacin (1g) is used in combination? Ans. Nicotinic acid (a derivative) results in flushing of face. Why? Vasodilation of cutaneous vessels. Therefore, we combine it with specific anti-flushing drug called laropiprant. Q. In hyperemesis gravidarum, what do you give for associated Wernicke's encephalopathy following hyperemesis? Lacunar infarcts are small (0.2 to 15 mm in diameter) noncortical infarcts caused by occlusion of a single penetrating branch of a large cerebral artery. Microatheroma of the origin of the penetrating arteries. Lacunar stroke is usually related to a chronic vasculopathy associated with systemic hypertension. Penetrating artery occlusions usually cause symptoms that develop over a short period of time, typically minutes to hours. However, a stuttering course may ensue, as with large artery thrombosis, and symptoms sometimes evolve over several days. As a general rule, lacunar syndromes lack findings such as aphasia, agnosia, neglect, apraxia, or hemianopsia (so-called "cortical" signs). Monoplegia, stupor, coma, loss of consciousness, and seizures also are typically absent. Pure motor hemiparesis: Characterized by weakness involving the face, arm, and leg on one side of the body in the absence of "cortical" signs (aphasia, agnosia, neglect, apraxia, or hemianopsia) or sensory deficit. Artery / structure involved: Posterior limb of the internal capsule. Mnemonic: PM - Pure Motor, Posterior limb of internal capsule. Pure sensory stroke: Numbness of the face, arm, and leg on one side of the body in the absence of motor deficit or "cortical" signs. Ataxic hemiparesis: Ipsilateral weakness and limb ataxia that is out of proportion to the motor deficit. Some patients may exhibit dysarthria, nystagmus, and gait deviation towards the affected side. As with other lacunar syndromes, the above-mentioned "cortical" signs are absent. Artery / structure involved: Fibres of the fronto-ponto-cerebellar system in the internal capsule / corona radiata. Sensorimotor stroke: Characterized by weakness and numbness of the face, arm, and leg on one side of the body in the absence of the aforementioned "cortical" signs. Artery / structure involved: Sensorimotor strokes arise from infarcts involving the posterolateral thalamus and posterior limb of the internal capsule. The exact vascular anatomy is debated. Dysarthria-clumsy hand syndrome: Facial weakness, dysarthria, dysphagia, and slight weakness and clumsiness of one hand are characteristic. There are no sensory deficits or "cortical" signs. Artery / structure involved: Lacunar infarctions of the anterior limb of the internal capsule, genu of the internal capsule, or corona radiata. Intravenous alteplase (recombinant tissue-type plasminogen activator or rt-PA) improves outcomes for patients with ischemic stroke in general if administered within 4.5 hours of symptom onset. The available evidence suggests that intravenous thrombolysis is beneficial for patients with lacunar stroke. Most patients with acute ischemic stroke who are not eligible for thrombolytic therapy should be treated with aspirin. If you forgot the afferent - efferent stuff from step 1, I have a mnemonic. Remember ACE ID, PDA ANC. Here are my notes. The most simplified version you'll get. There are additional situations of high thrombotic risk after ischemic stroke where anticoagulation may be beneficial but for which there are little or no data. These include mechanical heart valves, carotid artery dissection, and large artery atherosclerotic stenosis. Here's a short post on the key points about Congenital Diaphragmatic Hernia. So there's deficiency in the diaphragm during development causing abdominal contents to budge into the Thorax. Now out of these 2, Bochdalek is commoner. - Bag and Mask Contra indicated. So it's got an L in it. L = Left. So it's more common on the left side. These hernia classically cause a scaphoid abdomen and Mediastinal shift to the opposite side. - Not Big - Small sized. - Not as Bad - Prognosis is alright. It's got an R in it = Right. So it's more common on the right side. And it contains the Transverse colon generally. Here's a short Mnemonic/Review of Important facts about Croup - Acute Tracheobronchitis ! It's helpful to remember Acute EPIGLOTTITIS as the complete opposite of CROUPS using similar ideas. - Prodrome not particularly, but Stormy acute onset. - Shows Thumb print appearance on X Ray. It's on differentiating C8 radiculopathy from Ulnar neuropathy based on a question I solved the other day. How would you differentiate the two in clinical practice? - Radiculopathies are often painful. - Focal neuropathies aren't painful. Conclusion: The ulnar nerve innervates all intrinsic hand muscles, except the abductor and flexor pollicis brevis, opponens pollicis, and lateral two lumbricals, which are innervated by C8 and T1 via the median nerve which helps differentiating the ulnar neuropathy from C8 radiculopathy. The point where the anterior ciliary artery pierces the sclera is often marked by a pigment. 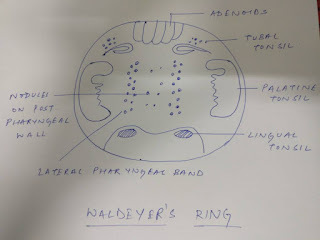 This is of particular importance while cauterization as in a bid to make everything look neat and shiny, the pigmented part shouldn't be cauterized as it will cause necrosis of the structures supplied by the artery. So this is a highly confusing topic. No matter how many times you read it, some amount of doubt is always there in your mind. So an advice to the readers, bookmark this post because you will be needing to read it more than once to get the drift. First of all, let us review the effects of Angiotensin II on Glomerulus. 1. Efferent arterioles have a smaller diameter in their basal state. 2. Ang II stimulates the release of vasodilator NO from the afferent arteriole. 3. Ang II minimizes vasoconstriction at the afferent arteriole via the stimulation of Ang II type 2 (AT-2) receptors, which result in vasodilatation through a CYP450 dependent pathway. The net effect of preferential rise in efferent arteriolar resistance is that the glomerular pressure is increased or stabilized(in hypoperfusion states), which helps to maintain or increase GFR. But in the long run, lots of fluid have been filtered out leaving behind the proteins which raise the colloid osmotic pressure, eventually enough to overrule the hydrostatic pressure and hence it leads to decrease in GFR. Ang II also reduces GFR by causing constriction of the mesangial cells which reduces the effective surface area for filtration. 1.A refractive error should be thoroughly assessed prior to surgical squint correction or the squint may recur. 2. Divergent squint occurs in myopes as the divergent system of muscles is more active during far vision. So, the far vision in myopes being hampered, the eyes try to diverge more. 3. Same goes for hypermetropes. They end up with a convergent squint if left uncorrected. If there's weakness in foot dorsiflexion, check plantar flexion and inversion. 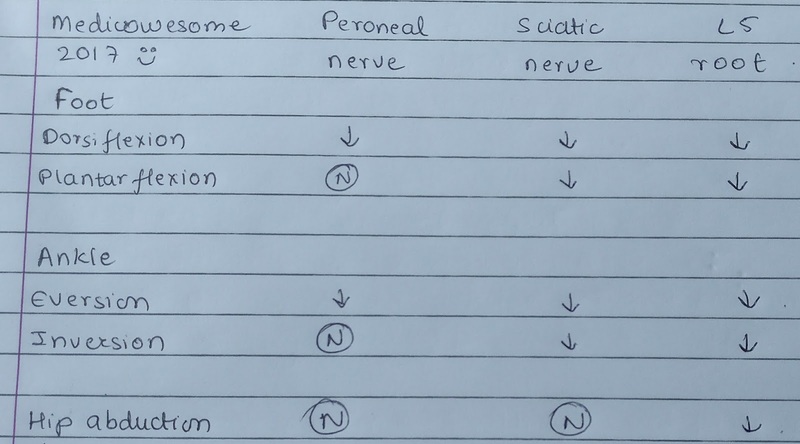 If plantar flexion and inversion is normal: Peroneal neuropathy. If plantar flexion and inversion is weak: Check hip movements. If weakness at hip joint: S5 radiculopathy. If no weakness at hip joint: Sciatic nerve compression. You can differentiate based on sensory levels and reflexes too but this is easier. Peroneal nerve supplies the dorsiflexors and evertors of the foot. There will be no weakness in plantar flexion and inversion in peroneal nerve injury. Hip abduction is an action of Gluteus medius and minimus muscles. These are Superior gluteal nerve innervated muscles. This nerve arises from L4, L5 and S1 roots . If there is hip abduction deficit with foot drop, it means pathology at the radicular ( root) level. - Acute foot drop (difficulty dorsiflexing the foot against resistance or gravity). - Patients describe the foot as limp; there is a tendency to trip over it unless they compensate by flexing the hip higher when walking, producing what is called a "steppage" gait. - Patients may also complain of paresthesias and/or sensory loss over the dorsum of the foot and lateral shin. 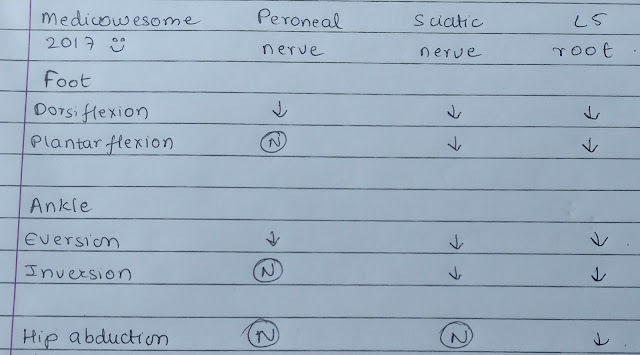 - Examination typically reveals weakness in foot dorsiflexion and foot eversion (deep and superficial peroneal nerve-innervated, respectively), with normal inversion and plantar flexion (posterior tibial nerve). - Sensory disturbance is confined to the dorsum of the foot, including the web space between digits 1 and 2 and the lateral shin. - Weakness affecting most of the lower leg musculature, including the hamstrings. - Hip flexion, extension, abduction and adduction, and knee extension are normal. - Sensory loss involves the entire peroneal, tibial, and sural territories. - In the lower leg, however, the medial calf and arch of the foot may be spared secondary to innervation by the preserved saphenous nerve (a branch of the femoral nerve). Sensation is also spared above the knee both anteriorly and posteriorly. - The knee jerk is normal, but the ankle jerk is unobtainable. - Back pain that radiates down the lateral aspect of the leg into the foot. - On examination, strength can be reduced in foot dorsiflexion, toe extension, foot inversion, and foot eversion. - Mild weakness in leg abduction may also be evident in severe cases due to involvement of gluteus minimus and medius. Atrophy may be subtle; it is most readily observed in extensor digitorum brevis. - Sensory loss is confined to the lateral shin and dorsum of the foot. - Reflexes are generally normal. Alvarado score is one of the most famous scores to clinically diagnose Appendicitis. Without further adieu let us delve into it. Of these the second parameter from above and second parameter from below have 2 points credited for each. Every other parameter is credited with 1 point each. The overall aggregate comes out of 10, which the highest possible score for Alvarado score. In some hospitals where a differential count is difficult to find, use a modified score with 9. That's all guys, if you find any mistake let me know. 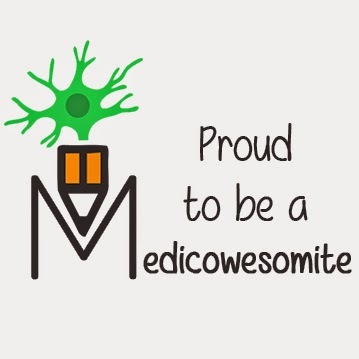 I must thank all my Medicowesome admin/author collegues for tolerating my rants and, help me to push through the hellish scary time together. Thanks everyone. Finally I'm through it, and I'm back to writing for you all guys. So thought to start the first post after returning, with a General Surgery Diagnosing score with the help of Schwartz Textbook of Surgery. A posterior staphyloma is common because the durability of the layers of the eye where the optic nerve enters the eye is lesser in comparison. Moxifloxacin is the preferred antibiotic in Ophthalmic surgeries and pathologies because it gets concentrated into the anterior chamber and the aqueous. Today we'll see some important points on Electromyography (EMG) and Nerve conduction studies (NCS). EMG evaluates abnormal electrical activity in muscles, and NCS investigates how electricity flows through a nerve. They help to locate and determine the causes of diseases that affect muscles and peripheral nerves. In EMG, a small needle is inserted into a muscle, to measure its electrical activity. In NCS, electrodes are placed on the skin overlying a nerve, and other recording electrodes are attached at a different point over the same nerve and a small shock is applied, and the electrical impulse is recorded​. Amplitude: The electrical signal is represented as a wave, and the amplitude is its height. Duration This describes the width of an electrical wave. ConductionBlock: The diminution of signal across an anatomical region such as the wrist. This suggests nerve entrapment. So when a nerve stimulates a muscle to contract, there is a brief burst of electrical activity called a motor unit action potential (MUP). 1)Fibrillations & positive sharp waves on the monitor seen in diseases of peripheral nerves. Muscles sometimes start having spontaneous activity on their own. 2)Fasciculations: Sometimes the abnormality causes visible muscle twitches. 3)Abnormally large MUPS : These are seen If a nerve has been injured and then regrows. On regeneration the nerve tends to branch out to include a wider area of the muscle and hence we get large motor unit potentials on the screen. 4) Abnormally small MUPS: When they're abnormally small or brief it suggests the presence of a disease of a muscle (a myopathy) where the muscle is unable to contract to and fails to provide the normal amplitude of the wave. 5)"Recruitment pattern": As a muscle is contracted, nerve fibers signal more and more bits of muscle (called motor units) to join in and help. In a neuropathic disorder, the amplitude of different motor units is strong, but there are fewer of them because the nerve is unable to connect to as many units. You may never come across an actual EMG for an interpretation,but it is always good to know the investigation. The interpretation of EMG and NCSs is not always straightforward and may not always lead to just one possible diagnosis — but the tests can reduce the number of diagnostic possibilities. People with low levels of vitamin A who live with individuals who were sick with tuberculosis were 10 times more likely to develop the disease than people with high levels of the nutrient, according to research led by investigators at Harvard Medical School. Another reason to love Mango! A new research by neuroscientists has updated our knowledge about the association between high cholesterol levels in people and prevalence of neurodegenerative diseases such as the Parkinson's. First lets have a word about mind - wandering.. "Mind- wandering (or task-unrelated thoughts) is an experience of thoughts which are totally unrelated to the task you are doing right now, especially when it demands attention. It involves activities such as reading, driving, attending lectures, etc." Let's see what this Dibucaine number is. So Dibucaine is a local anesthetic. Dibucaine inhibits 80% of the normal Pseudocholinesterase enzyme and 20% of the Atypical enzyme. The number is determined by measuring the percentage of Pseudocholinesterase enzyme that remains unchanged in the blood of individuals administered a standard dose of Dibucaine intravenously. Normal Dibucaine number is 70-80% i.e 70-80%of normal enzyme is inhibited by Dibucaine. If there is a point mutation in the enzyme making it a Atypical Pseudocholinesterase then Dibucaine will not be able to inhibit it and the number will decrease. This number is used to measure the activity of Atypical Pseudocholinesterase,and to assess the likely hood of prolonged apnea after succinylcholine administration. Sodium Fluoride can also be used in place of Dibucaine. If you know more on it Add to this information.